That’s the message from this year’s Oxford Economic Question Time. The event, hosted by Shaw Gibbs, Withy King and HSBC at Saïd Business School in June, attracted over 100 of the region's business leaders and shapers who gathered to hear Mark Berrisford-Smith, HSBC Chief Economist, share his view of the current state of the global economy. The audience then put their questions about the economy to an expert panel: macroeconomics specialist Jens Tholstrup, business editor Nicky Godding, Shaw Gibbs director Ed Porter and Withy King senior associate Julie Acock. The session was chaired by Withy King partner Simon Bassett. How long the UK economy would take to recover from the UK leaving the EU was the first question. Economist Jens Tholstrup said there wasn’t really a precedent as the only other country to ever leave the EU was Greenland, which has a much more simple economy than the UK’s. How long our national economy took to settle down would depend on the types of trade agreement and Government policy required, which could take anything up to a decade. Ed Porter added that the effect of inward investment to the UK could be dramatic for Oxfordshire. 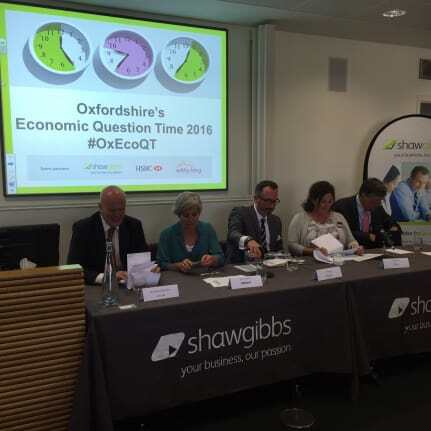 Turning to the Oxfordshire economy, questions centred on how the region can lift constraints on its growth such as lack of commercial space, unaffordable housing and a creaking transport infrastructure. Jens Tholstrup cited the lack of coordination around road improvement projects, which are not conducive to attracting business and embarrass firms who bring international visitors here, adding that Oxford is a brilliant location that is failing to reach potential. A lot more can be done to help businesses grow here. A number of initiatives to find solutions were put forward by the audience. Shaw Gibbs’ Matt Wistow cited the University of Oxford’s ambition to ‘growth a £1bn business in Oxford’ and that Oxford Sciences Innovation has been set up for this purpose. The Oxfordshire LEP is also a source of support for local businesses, providing help with finding premises, navigating regulation and so on. Richard Venables, a Oxfordshire LEP board member, explained that the science parks Milton Park and Harwell are where the resources and land are in place for real business growth. In Oxford, major developments such as the Westgate Centre and new rail links will all add to the city’s appeal but pressure on business infrastructure. Jamie Miller of Headway Oxfordshire turned the room’s attention to how businesses can help vulnerable people in the region. Simon Bassett explained Withy King’s policy of giving staff two days for voluntary work of their choosing, and how the firm itself carefully selects local charities to support based on the amount of good they will do in the community, rather than how they ‘fit with the brand.’ Jayne Woodley from Oxfordshire Community Foundation introduced the Reciprocate initiative, whereby local businesses come together to achieve more with the power of many through corporate social responsibility. Will Oxfordshire ever be free of its constraints on growth? Or is it destined to become a place for smaller businesses and innovation? Whatever the EU Referendum result, it’s pretty certain that these questions will be on the agenda at next year’s Economic Question Time. To register your interest in attending Economic Question Time 2017, email kate.healey@shawgibbs.com.